Well, I’d like it to be real travel, but I’m afraid it’s vicarious! The William Morris Gallery is located in London, which is a rather long hop from Kansas. 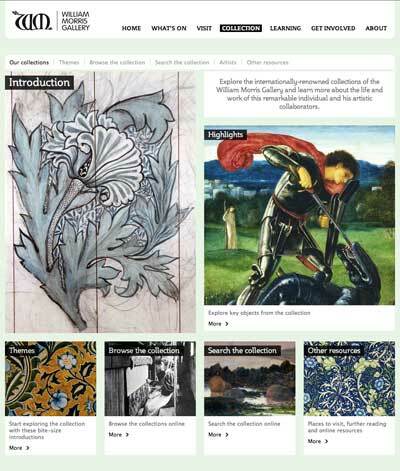 Still, the good news is that the William Morris Gallery has a wonderfully refurbished website, perfect for browsing from afar. 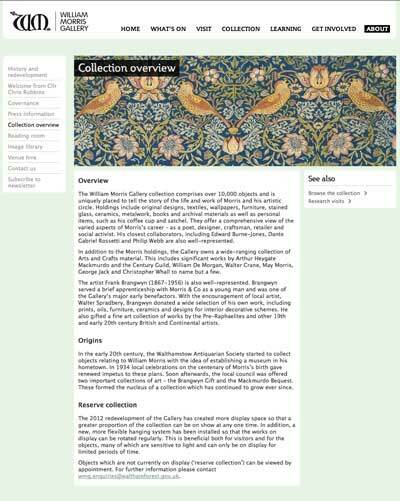 It’s worth looking at, if you’re a William Morris fan, or if you’re just wanting a bit of inspiration! Feel free to click any of the images to go directly the gallery. But back to the website and reality. 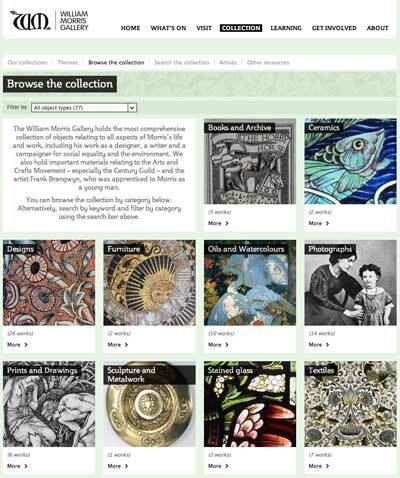 Definitely visit the Collection, where you can browse through different William Morris and related works. 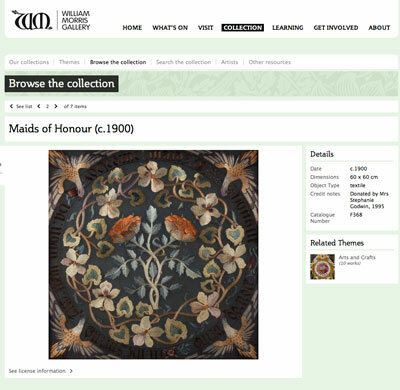 There are several categories here, each with a number of images of different items related to William Morris and his era. While the Gallery itself houses over 10,000 items, the website is yet a wee bit sparsely populated – still, there’s lots of beautiful stuff to see and interesting stuff to read! You must, of course, jump into the textile collection on the site! While there are only seven objects right now to view, some of them are really gorgeous. You should definitely pop in to see the owl! Hidden in the About section on the website, you’ll find the Collection Overview, which is good reading. There’s also a nice section there on the history and redevelopment of the gallery, where you can read about the architectural history of the house itself, plus information on the development of the gallery. Well, that’s my vicarious travel for today! If you happen to be putzing about London anytime soon with nothing to do, hop on the public transport and go visit the William Morris Gallery! And if you’re like me, squizzing about for inspiration online on a rainy Saturday morning, take a moment to enjoy the online resource. Hopefully, the future will see a further development of the site, but I’m excited to see it refurbished to this point, and will be watching it closely for additions! Oh, my! Thank you for taking us traveling with you, Mary. Oh, how I would like to recreate both the Maids of Honor and The Owl! Water House, William Morris’s childhood home is a stunning building in its own right. I live only a few miles away and visited it a few years ago before the recent restoration. Even then it was well worth a visit. Highlights for me were a beautifully styled and painted cabinet, which was full of small cubbyholes. It would make an incredible storage solution for a needlework stash. Morris’ philosophy of having only useful or beautiful things in your home frequently led him and others to make even the simplest furniture both hard wearing and attractive. Also the spacious 1st floor (2nd in the USA) landing overlooks a beautiful large window above the staircase. The view over the garden from it is lovely and I would love to live there and have my everyday living space there. I’d have a comfy chair, good lighting and do my needlework in that lovely inspiring place. I hadn’t realised that the work was complete, Thank you Mary for letting us know. I will have to arrange to visit again soon. I’m glad the website will allow those overseas to see something of this wonderful place. Thank you! Being a thorough Morris fan, I look forward to my virtual visit! You are a great travel guide! Thank you Mary! The Morris website is much improved & a lovely way to tickle a stitcher’s fancy any day of the week! Is this a good time to mention that there could be a few vicarious WM pleasures closer to home? “Arts & Crafts Needlepoint” by Beth Russell ISBN9781905400805 was a gift from a friend & features charts inspired by Morris & his contemporaries. A quick check on worldcat.org shows that it is readily available in libraries. For the quilters out there, Quilter’s Fancy in Cortland, OH stocks a number of WM-style fabrics & last I looked, there was an exquisite appliqued piece on display in the shop. Usual disclaimers, just recommending a look-see. For several years I have been trying to put together an Arts & Crafts exhibit that showcases Morris and his descendants in the “movement”. Although my dream is on the back burner for now, it is wonderful to see the interest of others in the A & C world. Thank you for the posting. On a related note, one can also vicariously visit the Birmingham city art gallery which has one of the best Pre-Raphaelite collections in the world. I was lucky enough to go to university in Birmingham (UK) years ago, and regularly used to visit the gallery to gaze at the Burne Jones/Wm Morris Holy Grail tapestries. Collection is at http://www.preraphaelites.org/ . They are truly awesome (in the traditional sense of the word) in real life. Lovely!!! 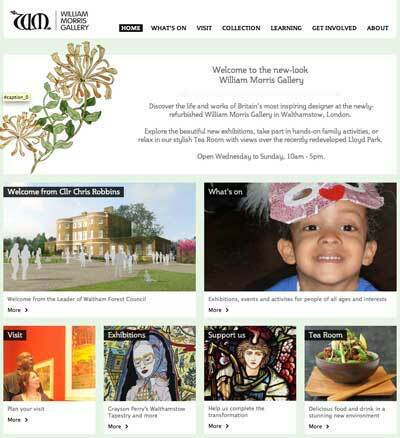 I live quite close to Walthamstow and I didn’t know the William Morris Gallery was there. I must go and visit I shall put on my list-to-do things in around London, after Buck Palace and the Olympic Village. Oh, it’s open again! I used to live just down the road from it, and would pop in every now and then. It WAS lovely, just the house and the collections displayed simply in glass cases with typed labels and dim light. And LOTS of thins on display, so many you had to really take your time, and even though it was a small museum, pop back if you wanted to absorb it all. Though a lot of the furniture was just out. I hope they havn’t ruined it, with all the video displays etc, they’ve spent quite a lot of money on it, and IME that never improves hidden gems like the William Morris. The cafe sounds nice though. I’m now about an hour and a half away by car, but I do get up there occasionally to buy fabric at Walthamstow market, so I shall check it out next time I go up there and report. Next Next post: Old Goldwork on Velvet – Any Questions?